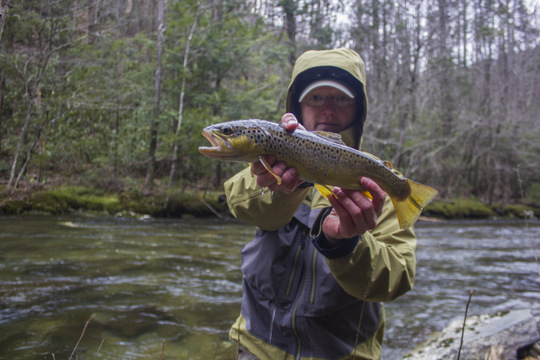 My first fly fishing experience of 2016 got things started off right, but wasn't to my favorite place, the Great Smoky Mountains. Needing to correct that situation, I headed out early on Sunday morning to get in a full day. Water temperatures had been rising for the last two days, peaking at around 48 degrees which is very good for this time of year. With more surges of arctic air in the forecast, I knew that I had better get out while the opportunity was there. Not wanting to waste any time, and surprisingly not in need of anything for the day's fishing, I skipped my usual stop at Little River Outfitters and headed straight into the Park. The high and low point of the day happened quickly and all with the same fish. 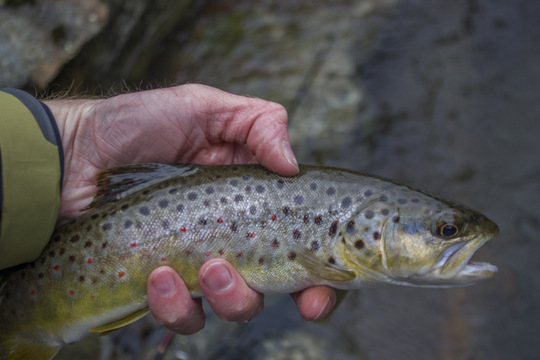 I had already stopped to prospect a couple of pools before I found what I was looking for: a large brown trout sitting out feeding in a very good spot to cast to. In fact, this was almost a gimme trout. Somewhere between 22 and 26 inches in length and sitting in a place where the approach was very simple, the fish was moving back and forth as it obviously fed on something small under the surface. Wading across the rapids downstream put me into the perfect position to fish for the brown trout. My first cast was too far to the side and short, but the next cast was perfect and the fish turned to follow my flies. For what happened next I can only blame myself. The fish had already followed the flies a couple of feet, and something in my brain made me think that it had ate. Running the replay in my head (as I've done many times already) fails to help me remember exactly what made me think that fish ate, but regardless, my failed hook set caused the fish to drift off into the depths of the run nearby. The trout was not so much scared silly as just concerned about food that levitated out of the stream in an unnatural manner. Just like that, my best shot of the day at catch a big brown vanished. If anglers were to give up in the face of adversity along the lines of what I had just experienced, fishing trips would generally be short. With the whole day still to go, I stuck with the game plan. Instead of spotting fish, I decided that I would probably be better off just covering a lot of water, so that is what I did. Quality browns indeed. Dave you look cold. It was definitely a little chilly that day. Beauties! Our streams here are jumping between ice and high water... tough but not impossible. Looks like yours are perfect though! The flows are getting lower than I like this time of year, but we are supposed to get some rain over the next week or two that should bump flows back up. Any fish caught makes the trip worthwhile. Go back and get that bad boy David. Howard, I went back just the other day and never even saw the monster. Oh well, I'll keep trying. I'm not one for numbers, especially in the winter, but I'd say those numbers look good to me! 3 fish caught in winter...awesome. 1 fish is awesome ha. Nice stuff. You definitely won't find me complaining, especially this time of year. I'm normally a quality over quantity type person anyway.